MINNEAPOLIS--(BUSINESS WIRE)--Although most Americans still share concerns about retirement – including nearly two-thirds (63%) who fear running out of money in retirement more than death – baby boomers are finally showing signs of optimism about their retirement readiness, according to the new Generations Ahead Study* from Allianz Life Insurance Company of North America (Allianz Life®). More than seven in 10 boomers (72%) said they feel financially prepared for retirement, an increase of almost 15% from 2010. In addition, less than one-third of boomers (32%) said uncertainty about their financial future makes it difficult to know when they can stop working, an improvement from 2010 when half (50%) said they were unsure about when they could retire, if ever. Interestingly, the other generation finding the most savings success is not the next in line. While Generation X continues to struggle with saving and spending, millennials – although not without their own unique financial challenges – seem better positioned for retirement than their closest predecessors. Median retirement savings for Gen X is only $35,000, the same median amount as millennials, despite Gen Xers being much closer to retirement. As a result, millennials more closely mirror boomers in feeling prepared for retirement (74% millennials, 72% boomers) and having confidence their income will last a lifetime (76% millennials, 67% boomers) – while Gen Xers are clearly feeling more vulnerable (63% and 58%, respectively). Despite the strong positive attitudes millennials have on being prepared for retirement, they also exhibit some worrying behaviors. While boomers are proud of their newfound saver status, millennials like to spend, with the majority (63%) claiming to be “spenders” and nearly one in five (17%) admitting they spend money “as soon as I get it” (versus only 6% of boomers). Half of all millennials also say they spend more on going out than they do on rent or mortgage (versus 16% of boomers). Despite these financial challenges, new savings strategies and a desire to avoid repeating the mistakes their parents made have had a positive effect on millennials’ retirement readiness. Although largely eschewed by boomers, millennials have embraced online apps to help manage money and/or track spending (70% versus 24% of boomers). And where technology fails, more millennials are happy to use traditional money management methods like a notebook or planner to manage expenses (63% versus 28% of boomers). Millennials are also more than twice as likely as boomers to set up “tricks,” such as setting up different accounts for different goals, to get themselves to save money (71% versus 32% of boomers). Millennials’ more proactive approach with money management is driven by a belief that their parents made financial mistakes and they can do better. Two-thirds (66%) of millennials say they are “much better with money” than their parents were and a similar amount (65%) say they are uncomfortable with debt because they saw they parents struggle with it. The end result: millennials have the most confidence of any generation that they’ll be able to fund their life goals (78% versus 67% boomers and 64% Gen X) with one quarter even feeling “extremely confident” they’ll be successful. Allianz Life Insurance Company of North America, one of FORTUNE’s 100 Best Companies to Work For in 2017, has been keeping its promises since 1896. Today, it carries on that tradition, helping Americans achieve their retirement income and protection goals with a variety of annuities and life insurance products. In 2015, Allianz Life provided a total of $2.6 billion in benefit payments that supported policyholders’ financial objectives. As a leading provider of fixed index annuities, Allianz Life is part of Allianz SE, a global leader in the financial services industry with 142,000 employees in more than 70 countries worldwide. More than 85 million private and corporate customers rely on Allianz knowledge, global reach, and capital strength to help them make the most of financial opportunities. *The Allianz Generations Ahead Study was conducted by Larson Research + Strategy via online survey in May, 2017 with 3,006 U.S. adults ages 20-70 with a minimum household income of $30K+ and was commissioned by Allianz Life. 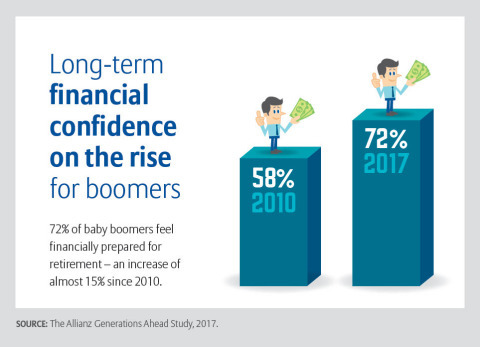 Although Americans share retirement concerns, baby boomers are finally showing signs of optimism about retirement readiness according to Allianz Life.